Hey, you know what's fun? Opening up the car's sun roof and enjoying all of that vitamin D on a warm spring day. Hey, you know what's not fun? When the sun roof is not completey shut and you go through a car wash. I got a nice surprise when a few gallons of soapy water dropped onto my crotch. 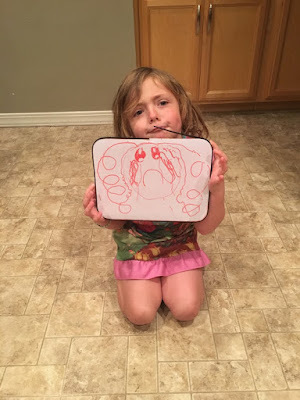 Hayden is working on her happy and sad faces. The spring weather has been a little wet in Idaho so far. Hayden and Frizzle seem to enjoy it. 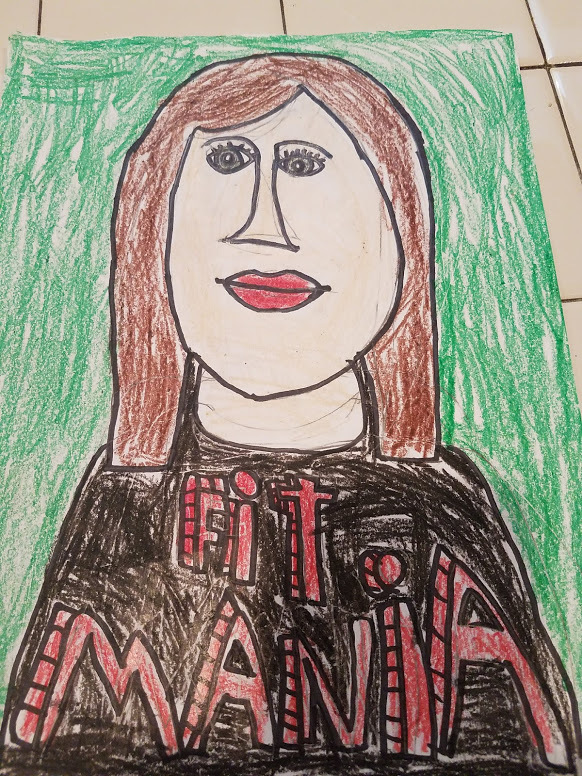 Kyle made a portrait of Mrs. Shife. I think he likes his art class. 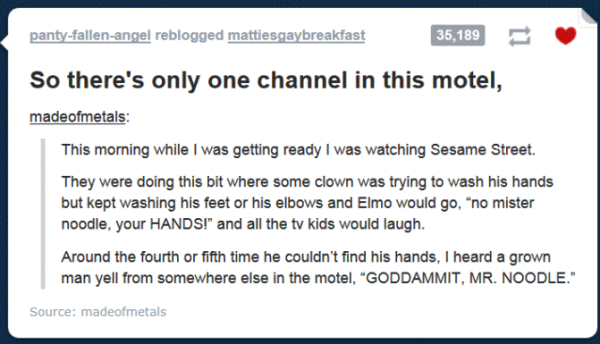 This made me LOL because we used to watch a lot of Elmo and Mr. Noodle with Kyle. My GIF to you is a reminder that life moves pretty fast so be careful out there. Well, that's all for today. Thank you for stopping by, have a wonderful weekend, and I will talk to you sooner than later. Glad some folks are enjoying the soggy spring! with snow expected is in the schedule. 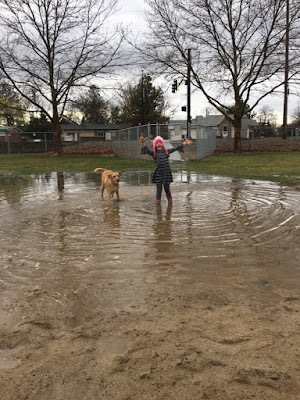 It looks like spring is finally happening in your part of the world, and a little on the watery side. 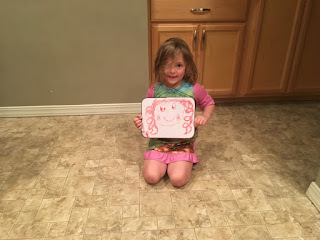 Great pictures by both your kids. Glad Kyle is liking art class - looks like he's got some extra talent in that area. I hope you weren't on your way to work after getting washed! Our weather is being very psychotic. Nice one day and torrential rains the next. 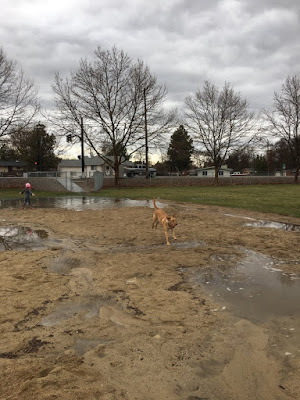 But that is one darn big puddle! Your Kyle has talent! Going through a car wash & getting 'washed' yourself in the process isn't rad. Nothing worse than a crotch full of soapy water. Well there is but I won't mention it here. Have a rockin' good weekend. The car wash episode made me laugh... and how! 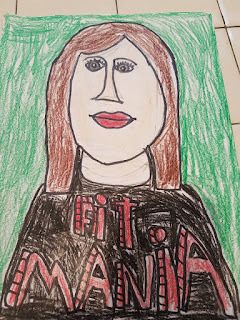 I am impressed at the artistry your children are showing. Finally, please keep the rain to yourself, I've had enough bad weather. If it's not snow it's rain... and freezing cold. Have a nice weekend. That's exactly the reason that I declined to have a sun roof on my car when we bought it. The 'happy/sad' face is a cute set of pictures. Julia will do something similar with her own face that we need to document on film one day, as many of the faces she'll make are priceless. 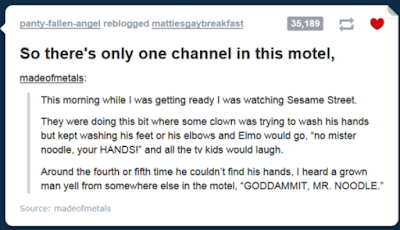 That damn Mr. Noodle strikes again. I have been crushing so many 1970's and 1980's Sesame Streets lately with my little guy. He is starting to know their names, but he consistently calls Cookie Monster, daddy. I would be offended, but I did eat like 12 Girl Scout cookies last night. The kids are getting so big! And good artists! We had ice and snow on Easter here in St. Louis. We've had the winter that just won't end here.